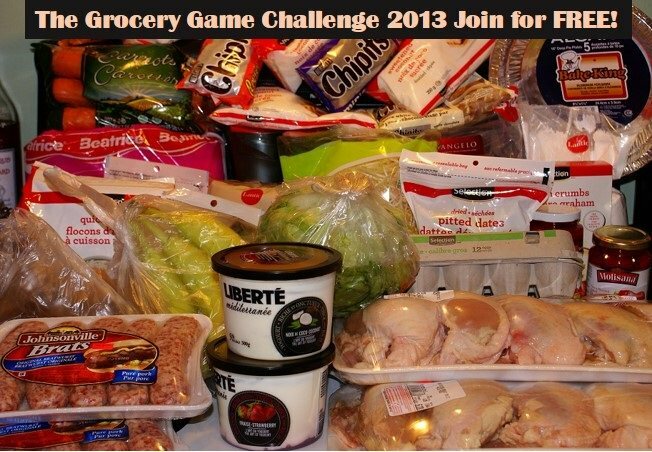 The Grocery Game Challenge Nov 25- Dec 1, 2013 #4 : How do you like your bread? Do you find that you consume more or less bread at different times of the year and that you are changing the brands you purchase frequently depending on price? While at the grocery store yesterday we noticed there are so many bread choices available these days and most people do what we do, stand and stare. Almost everyone buys bread unless you don’t like it, make it at home or simply just don’t care to purchase it and will be a driving force especially if bread is on sale in the weekly grocery flyer. 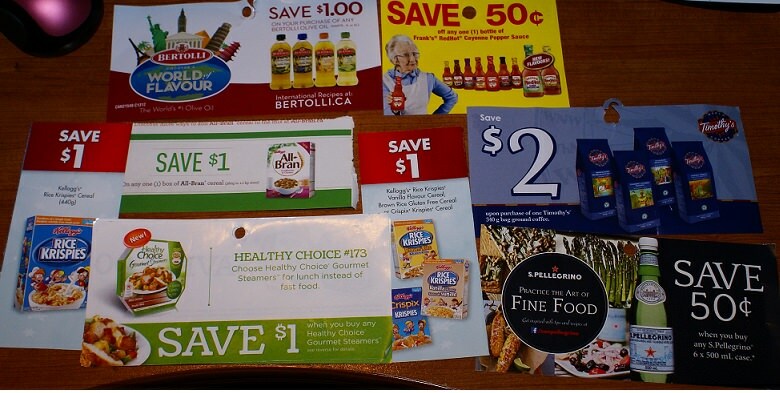 Bread deals are a fierce competition amongst the different companies and coupons are just icing on the cake especially if that motivates you to buy the product. 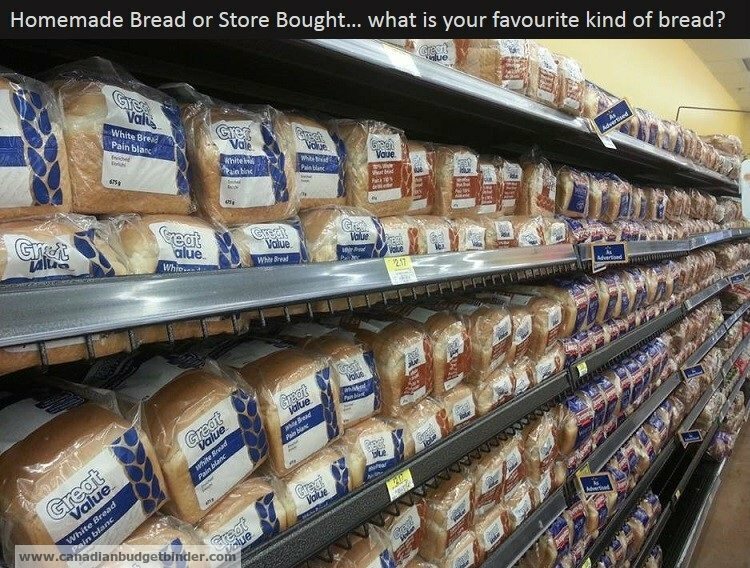 Although we don’t purchase much in the way of bread products we do stock up when we can find pink stickers offering 50% off in the Loblaws stores or we can get a great deal using coupons. I’m going to have to agree with many that homemade is always better but what it boils down to for many is the price and for a great majority the health benefits of the loaf of bread they plan to buy. I find that I spend more time looking through the bread section because the list of bread products is endless. You can get everything from raisin bread to protein bread to sugar-free bread to the new gluten free bread. You can even get bakery baked fresh bread in most stores even if there is no bakery in-store as it is brought in from out of town bakeries. It’s the consumers that are working hard to convince the manufacturers that they need this high nutrition bread so they are churning it out in hopes of making a big profit. The problem is the cost to make the bread so nutritious is high and most people frown at paying more than $2.00 per loaf of bread these days. The cost of ingredients alone for the bakery or manufacturer can be very high and those costs in most cases get passed along to the customer. Higher wheat prices do affect Canadians as outlined in this 2010 article in The Globe and Mail “How higher wheat prices affect Canadians” although record crops were produced in 2013 in the Prairies meaning wheat prices could potentially go down because they simply have no where to stock it all and demand is trending lower. This is all to do with the basic principal of supply and demand economics. I was watching an episode of Undercover boss the other day who went into the Mandarin restaurants and I was shocked to hear they made approx $1 per dinner buffet per person and it was the drinks that drove up the sales, so they push beverages. They subsidize the cost of the meals with the extra profits they make on the drinks. 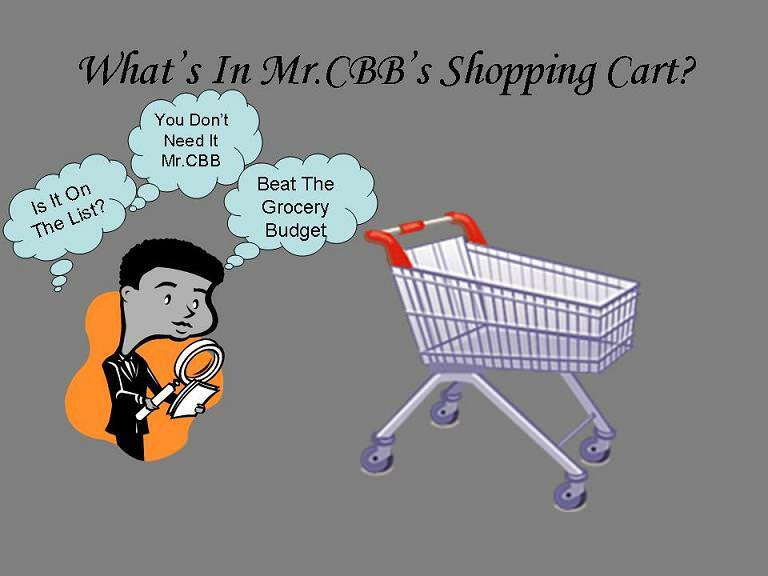 Sometimes we automatically think that businesses are cranking in the cash and in most cases they can depending on the marketing and execution by the team but it’s not easy for them and of course for us as consumers who are watching how much money we are spending in our budget and trying to stick to a grocery list that entails all the daily essentials including bread, butter, milk, eggs etc. What I’ve noticed is that since the price of wheat is so high the price of bread has gone up exponentially at least in the past couple of years. Just to purchase a decent loaf of bread you are looking at $3-$4 unless you can find it on sale. This week for example if you like whole wheat bread Food Basics has the Dempsters Whole Wheat bread on sale for $1.88 which is a great price for those of you who enjoy that type of bread. Tortillas on the other hand cost a bleedin’ fortune and it’s hard to justify spending nearly $5.00 for 10 tortillas when you can make them homemade for so much cheaper. Yes, the rounds might not be perfect and the tortillas not as thin but they work just the same and taste even better because they are homemade. So, if you want to save some cash and don’t mind a bit of elbow grease making homemade tortillas is super easy to do. I notice the competition between bread companies is becoming more fierce with Wonder bread and Dempsters in particular although I personally fancy Dempsters bread because I enjoy the various brands they offer. I also like ACE Bakery bread but be prepared to pay for this premium homemade style bread. For a while we would buy the odd loaf until I decided to create my own homemade olive bread and went on to do an olive pita bread. If you don’t mind spending some time in the kitchen you can save some money in your budget and enjoy that homemade taste and smell in the air when you are baking. Sure you might be able to score some great deals on sliced bread but in the end anything made with your two hands is worth a shot. I asked my Facebook fans if they buy hotdog and hamburger buns in the winter and what their favorite breads were to purchase and this is what some of them said below. Allyson T: Where I live, Safeway makes the cheapest bread. I could make my own bread, but until I am done school I will never have the time. $1.29 a loaf is not too shabby though. Mary C: Franz Gluten Free 7-Grain bread for me… hubby, it depends on what’s on sale. Della F: My favourite is whole wheat loaf that I can pick up at a local outlet for $1.00 per loaf. Edna M: I love Wonder Bread..Whole wheat..But we also buy Country Harvest when it is on sale. Pam W: We don’t eat much bread, but homemade bread is by far my favorite. 2nd choice would be City Bread’s Rye bread. We rarely use hamburger and hot dog buns in the winter. Occasionally I make tortillas. I absolutely hate packaged breads like Wonder Bread or Ben’s, I hate the texture and the taste (or lack of it)…I refer to those breads as glue bread. Sally T-P: I usually buy the store brand or whatever is on the markdown rack. We do eat burgers in the winter (sloppy joes too), and we like Polish sausage on a hot dog roll every once in a while. Jen P: My favourite is Vitality by Country Harvest. I buy the fat-free/sugar-free variety. It’s awesome. It’s $3.08 a loaf so I try to buy it when I see 50% pink stickers or I price match it a lot as well. It rarely goes on sale but I love it and it’s way lower in fat and calories then comparable breads. Beth A: I mostly bake my own but I’m the pits at making raisin bread so I do buy that when it’s on sale, and I buy Safeway cheese sticks for my fella because they cost about the same to buy (on sale) as they do to make. I buy bagels ’cause I don’t enjoy making them. We don’t use hot dog or burger buns as much in winter. We use tortillas, poppadums, and naan year round. “Specialty bread” = higher prices so I avoid these trendy items whenever possible. I can bake it better, and much less expensively myself. Bread for snacks mostly, bagels for the younger boy to have at breakfast and what ever whole wheat or multigrain is on sale. What is in here right now is Dempsters Whole Grain multigrain… I need to get out the bread maker again…. Nicole J: I like little big bread , by Silver Hills sprouted bakery. It is 90% organic, high in fibre, non GMO, and tastes like a nice bread but with fewer calories/fats. What are your favourite breads and who make them? Do you use hot dog and hamburger buns in the winter much? or do you prefer pita, tortillas etc? Do you like specialty breads such as raisin bread, protein breads, no-sugar added, high-fibre, whole grains, gluten-free…. share your thoughts and your favourites. Weekly Overview: Well, we went over budget for the month but not by too much which is a good thing. In December we will be going away for a few days and then away for a week for the holidays so hopefully we won’t be going over budget in December and if anything will spend less than the grocery budget. We are definetly a family that adores bread…..and a family that all adore different breads!! It seems like when we purchase bread we need to buy specific organic bread that I love…hubbies whole wheat….small dinner rolls for my daughter….bagels for my son…hamburger buns…and hot dog buns!! I always buy when i can at 50% off and freeze!!! It saves a ton of money!! Here is my shop for this week. I have to get on the Checkout51 bandwagon… I was going to do it this week but I need to set time aside. I am signed up for it though. 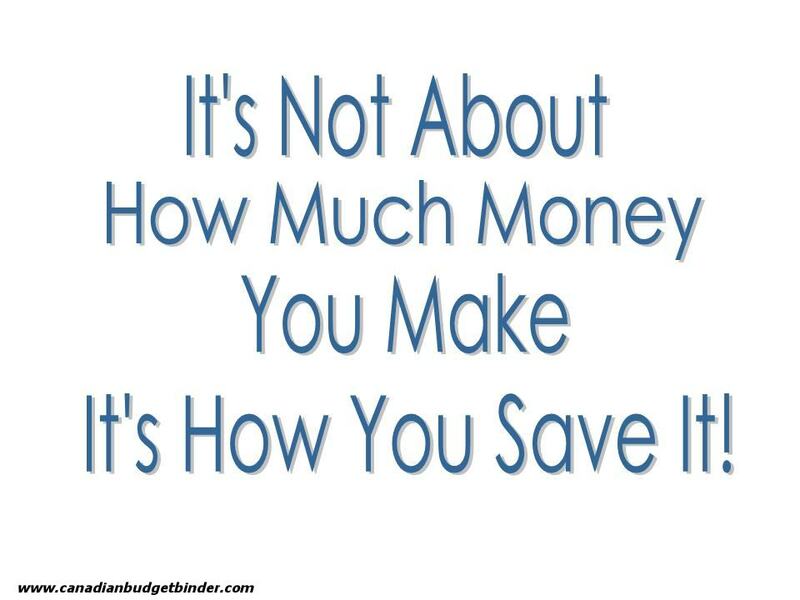 Considering your year to date is where it’s at you may end up spending less than you budgeted for the year which is awesome…. I’ve noticed that your shops have changed considerably over the year and I’m proud of you. I see you are buying much more healthier foods and cooking more full meals. You’ve come so far and I’m proud of you> I can only imagine what 2014 will bring for you. Keep it up. Mr.CBB You get ballot 3. $2.99 snowman sippy cup – I couldn’t resisit!! Sure, sure you couldn’t resist hahaha… see they know someone will buy it. There’s a buyer for everything they say. Hey that sounds like a great post title.. Good deal with the pop. You are on it with those pop coupons every year lol. Looks like you piked up some great bogo deals this week. Good for you. Keep up the good work. You get ballot 2. Here are my shops for this past week, all were at Foodland. I came very close to making it this month. After week three it didn’t look promising but I almost did it! So there it is….. I did go over for the week and the month but it came a lot closer to the mark than I thought I thought I’d do…I bought the absolute needs and had a few dives into the freezer for ideas. I had chicken in there, ground beef and the remains from the Thanksgiving turkey to use for meals.I picked up the milkbones as we were supposed to go to my SIL’s place last Sunday but didn’t as hubby wasn’t feeling well, nor was the older boy. I just wasn’t comfortable leaving either one at home so we all stayed put. She had a crowd there anyway so it’s all good. We will get together another time. Driving is always an issue this time of the year as well. Numbers for the year are shot but I will take a good hard look at things going into the new year…… I tried this year but there needs to be more thought for next year…. My fiance eats a lot of bread, but me, not so much. Only when we have nothing else in the house! I don’t really like sandwiches or toast. We just buy the bread from the grocery store, it’s usually pretty cheap. We usually just use it for toast or we make our own. This week’s shopping is really minimal. I wanted to take advantage of a rain check for bacon and I needed a cabbage… what’s homemade soup without cabbage??? My best news though is that I got a rain check for the 1 kg honey hams @ $8.49! I’m always looking for the sale bread at the stores!! I need to dig out the bread maker and get it going again. I bought some yeast for it and I think I might try to find a little treat for Christmas to make there. My one sister-in-law loves her bread maker!!! She was behind a couple of the bread machine cook books I got from my late MIL ages ago!! The one advantage I have found with not using the bread maker and kneading by hand is the chance to work out a little frustration while kneading!!!! Take that!!!!! And that!!!!! Pounding the daylights out of it can feel so refreshing!!! I need to post my shops for this week but I will likely have to go back to the store again judging from the looks of my milk supply so I will wait until after that. It’s going to be close….very close. I think I’m just under right now…..I’ll see how things add up Friday as I work my week to go along with the flyers, it’s just easier for me that way and back when hubby was working he was paid on Thursdays so it all worked out. You are so easy to please Catherine ha! It literally takes about 3 minutes to plop everything in, and walk away. We had a problem with the bread rising too much, so we adjusted the sugar down, and all is good. We rarely buy bread, because we use our bread maker. About the only times we so, is at one particular place that sells cheese bread for 99c ( on sale ). Can’t make it cheaper than that. What types of breads do you make in your bread maker? I’m boring, my favorite is white bread. On occassion we have made cinnamin, thyme/oregano bread. Now that sounds like an interesting combination.. cinnamon, thyme/oregano. What made you come up with using those three spice? What does it taste like? My husband, when he bakes the bread, like to try different flavours. One son would put cinnamon sugar on his toast…so that’s what inspired the cinnamon bread. It’s very mild tasting. Sometimes I make mini pizzas, with bread as a base, and adding thyme/oregano just gave it extra flavour. It’s also good when eating pasta, or garlic toast. You deserve all that cheap bacon too. One thing I find here is the bacon is sliced so thin. I like thick bacon like back home. I’m eating the chicken we bought now and it’s so juicy. I’m happy we bought what we did. Can so identify with your bread post! So these days I’m trying to stay away from too much wheat, bleached flour, carbohydrates, yeast, gmo bread..basically left with nothing haha. I look at the ingredients and I feel guilty if I buy bread and tummy a little churning knowing the ingredients are not great for the body. I like the taste of Ace Bakery tho the organic ones, get them at 50% off. At times I just bake my own with unbleached flour. Did a 2 week experiment without yeast, rice , bread and funny thing I noticed a difference in my body…just felt kinda better. Oh well to each its own.